Taylor Swift: Myth or Legend? Paparazzi will do just about anything to get their shot, and celebrities have been finding new and creative ways to dodge the lens. Think celebs hiding behind trashcans, covering their faces with paper bags, and even wearing the same outfit every single day just to piss the papzz off. All great ideas! However, Taylor Swift has defied all odds. She’s been keeping a beyond low profile this year, until recently. Earlier this month, photos emerged leading “Swifties” to jump leap to conclusions. The pictures show two men carrying a large suitcase from her apartment into a car on two separate occasions. Usually not a big deal, right? Think again. The photo captures two men carrying the suitcase in an extremely delicate manner, while her bodyguard stands watch. In any other case, no one would think twice about this photo. But the media hasn’t seen Taylor enter or leave her apartment in months, so she MUST be traveling via suitcase! 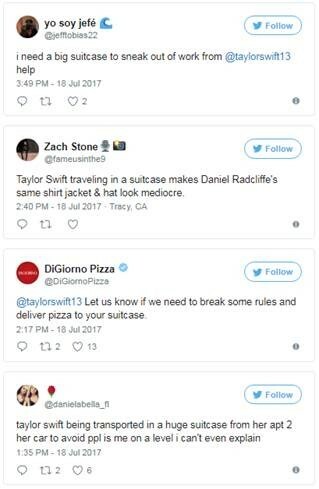 While the logistics of a 5’10” human fitting inside of a suitcase is a little fuzzy, and nothing has been confirmed, Taylor had everyone going crazy. The moral of this story? People need to get a life.